Sometimes, it's fun to be matchy-matchy. I got this amazing new Lotus Romeo jacket from TacknRider. It is the perfect warm up jacket! I love how well it went with my white Sakkara breeches. These are the most comfortable, flattering breeches out there; don't just take my word for it! They're like a second skin while still being durable. The cool thing about this jacket is it is totally customizable with the color combinations. 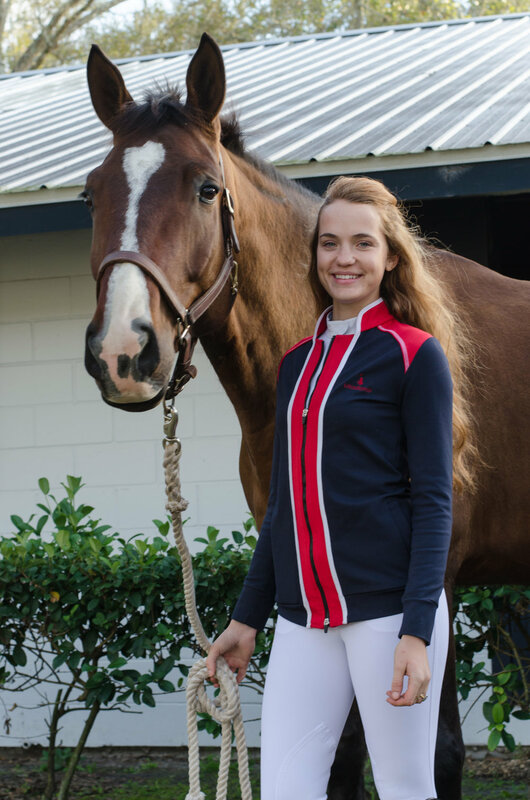 I think it would be the perfect jacket to get in your barn colors for a horse show! To carry on this red, white and blue theme, I put on my white Lotus Romeo show shirt and put on a PERFECTLY matching Ellany Equestrian elastic belt! This Ellany belt is amazing and the only elastic belt out there that is also adjustable! They're cute and now functional, too. I can't wait to rock this look in the jumper ring. I also really want to buy this jacket and belt in every color combination and just wear this look on repeat! Who's with me? !